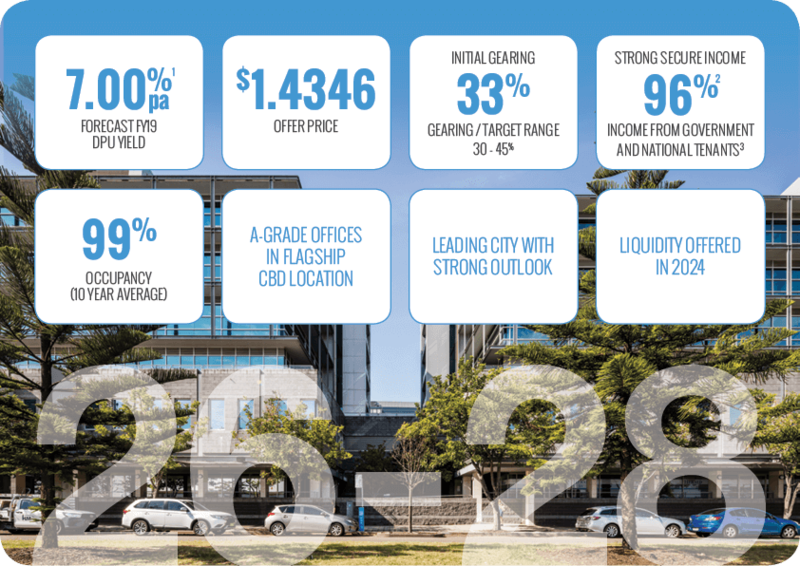 The APN Regional Property Fund offers investors the opportunity to invest in two A-grade office properties that have recently undergone a major asset enhancement program. Located in the fast-growing region of Newcastle, with access to excellent transport options, the buildings are well leased to Government and national corporate tenants, underpinning stable and secure rental income. 1. Forecast distribution rates are not promised nor guaranteed, and are calculated in accordance with the assumptions outlined in the Product Disclosure Statement 4 February 2019. Returns are not guaranteed. *Forecast distribution rates are not promised nor guaranteed and are calculated in accordance with the assumptions outlined in the Product Disclosure Statement dated 4 February 2019. Returns are not guaranteed. * As at 1 May 2019 following commencement of the Yancoal lease. To invest in our Fund, please read the Product Disclosure Statement (PDS) and fill out an application form. You can access them here. As with all investments, an investment in the Fund will be subject to risks, some of which are outside the control of the Responsible Entity and the Directors. All investments are subject to varying degrees of risk and investments generally go up, as well as down, in value. Asset classes perform differently at different times and have different risk characteristics and volatility. When you consider an investment in the Fund, you should consider your personal risk tolerance. Past performance is no guarantee of future performance. The Responsible Entity does not guarantee the income of the Fund or the return of capital to investors. It is important that you read the Product Disclosure Statement in full before deciding whether to invest and consult your financial adviser, stockbroker or other professional advisers should you require advice or clarification. This information has been prepared by APN Funds Management Limited (ACN 080 647 479, AFSL No. 237500) (the “Responsible Entity”) as the responsible entity and issuer of the financial products in respect of APN Regional Property Fund (ARSN 110 488 821). The APN Regional Property Fund is a direct real estate fund listed on the National Stock Exchange (NSX code: “APR”). Information contained is current as at 4 February 2019 and does not constitute financial product advice and does not purport to contain all relevant information necessary for making an investment decision. It is provided on the basis that the recipient will be responsible for making their own assessment of financial needs, will read the Product Disclosure Statement in full and will seek further independent advice about investments as is considered appropriate. This webpage does not constitute an offer, invitation, solicitation or recommendation with respect to the subscription for, purchase or sale of any security, nor does it form the basis of any contract or commitment. It is important that you read the Product Disclosure Statement in full before deciding whether to invest and consult your financial adviser, stockbroker or other professional advisers should you require advice or clarification.